I have spent a frustrating number of years looking for water hoses that don’t kink and are non-toxic. Many have claimed to have these properties but none have actually had them. A local distributor highly recommended a well known brand to me a few years ago. It was a really bad recommendation. In the winter, it won’t bend at all. It’s not much better in the summer plus it has toxic outgasing chemicals in it, and it still kinks. Well guess what? Success, I have found the best water hose. It is called the Water Right Hose. It is made of non-polluting chemicals, light weight, very easy to handle and it doesn’t kink. You can get it to temporarily kink, but you have to really work at it. It comes in 4 lengths and 3 colors. I like the olive color. The Water Right Hose is a delight to use compared to other hoses and I recommend you give it a try. The 15 inch connection was made as a sample for trade shows, but I talked the owner into making it an available product. 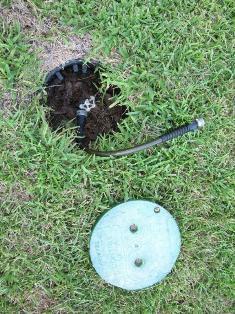 It's great for underground hydration or any other hard to reach hydrants or hose bibs. 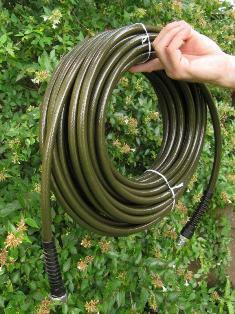 We wish all retail stores carried this, but until then it is available here: Water Right Hose.